In the über-macho, rough-and-tumble world of race car driving, the top female engineer in NASCAR is blazing quite a path and using it to give back to her native Puerto Rico. 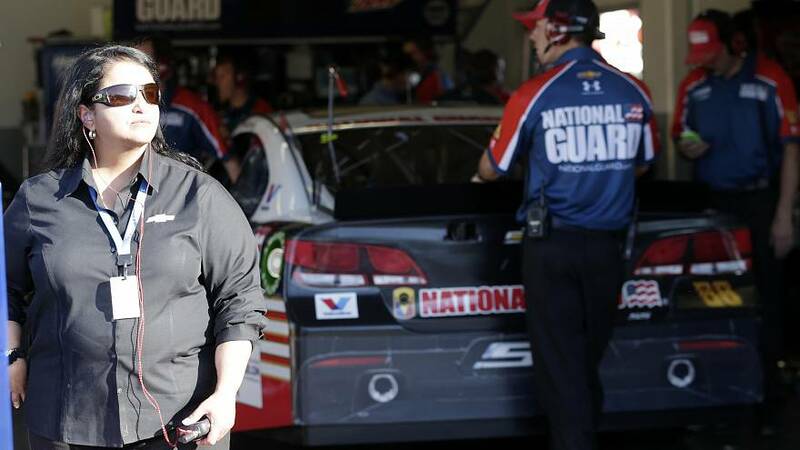 "When I went to the university it was mostly guys, so the fact that I'm in a job where it's mostly guys seems normal to me," said Alba Colón, Chevrolet Racing Program Manager for the NASCAR Sprint Cup Program, General Motors' most visible racing program. Colón oversees the engineers who test the engines and designs for the NASCAR drivers. "I fell in love with drag racing and I didn't realize at the time that I was the first female, the first Latin American," said Colón, who describes herself as a "worker bee" who is aware of her pioneering role. "Every day I go to my job and I think, people are looking because you are representing something that is not the usual thing," she told NBC News. "I take this job with a lot of pride." Colón is a graduate of the prestigious engineering program at the University of Puerto Rico's Mayagüez campus, in the western part of the island. UPR-Mayagüez has long been known for its science and math degrees and is a hub for U.S.-based recruiters. General Motors hired Colón in 1994 as a data acquisition engineer, and since 2001 she has been with the company's NASCAR cup series. For years, Colón has been closely associated with recruiting and retaining graduates from her alma mater in Puerto Rico to come work for General Motors. After the devastation of Hurricane Maria, this role taken on even more importance. Young people in the island, said Colón, are "very anxious" to get jobs, summer jobs and internships lined up. "They are very smart and hard workers. They don't have a lot of resources compared to other universities in the states, but they take the same classes and they have to find how to make things happen with the little resources that they have," said Colón. "Those are skills we look at, that passion to make things happen." Colón said she takes a holistic approach to recruiting, particularly among students in Puerto Rico who may consider a move from the tropical island to the cold Michigan winters where GM is headquartered a bit of a culture shock. She emphasizes to potential hires that the company is not just a job. "We sell the company as a family. More than 100 companies recruit at the University of Puerto Rico and we are competing against them. What everybody tells us is, we know the companies and what they offer - but they want to know if they fit in, if they have a family there, if there's going to be somebody there for them," said Colón. "We have our little Puerto Rico at GM with our little celebrations," she said. "It's not just a job. We sell them on that by showing them what we do and that we have to stick together and help each other, and we have been very successful." Colón is also working with the group Team GM Cares. Hundreds of GM employees have donated more than 12 tons of goods, including batteries, solar cellphone chargers and lights, bottled water, and canned goods, among other items, and along with other engineers Colón is looking to "adopt" a region on the island as residents work to rebuild and revitalize the community. While more than 40 percent of the NASCAR fan base is female and the percent of Latino fans is more than a third and growing, Colón stands out. Because she is considered a trailblazer, she was recently honored by the Hispanic Heritage Foundation (HHF) with a STEM Award, recognizing her work in a historically underrepresented field. "Alba Colón is a transformative role model for our community," said HHF President and CEO José Antonio Tijerino. Colón said she recognizes the meaning of awards such as these. "It's validation and it's the responsibility that you have to help others that come after you," said Colón.